If you are new here, then welcome! 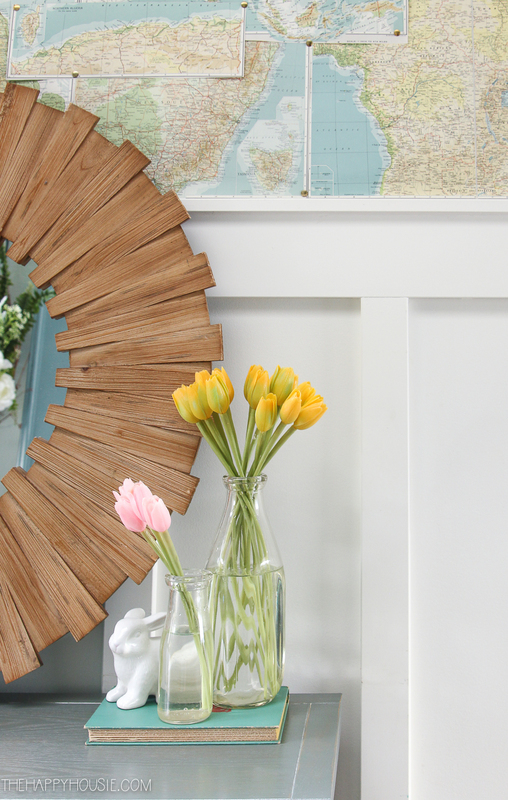 I’m happy to be joining Jenna from Wife in Progress this week for her spring home tour series. If you’ve hopped over from Laura at Inspiration for Moms, or from any of the other lovely blogs on this tour, then you can learn more about me and this blog here. 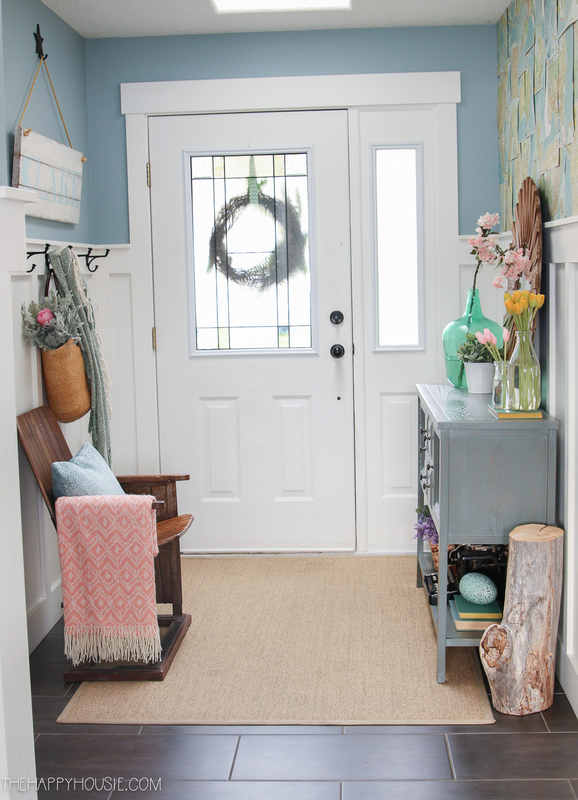 Today I’m sharing our spring entry way along with some recent changes we made to our foyer and tips for decorating a small entry way. We all have spaces in our home that we don’t love. That for some reason or another, never feel quite “right” or “done”. The entry way has always been that space for me. I don’t know if it’s because it’s such a small, narrow space or if it’s because I’ve never had the right combination of furniture, but for some reason it has always felt a bit off. 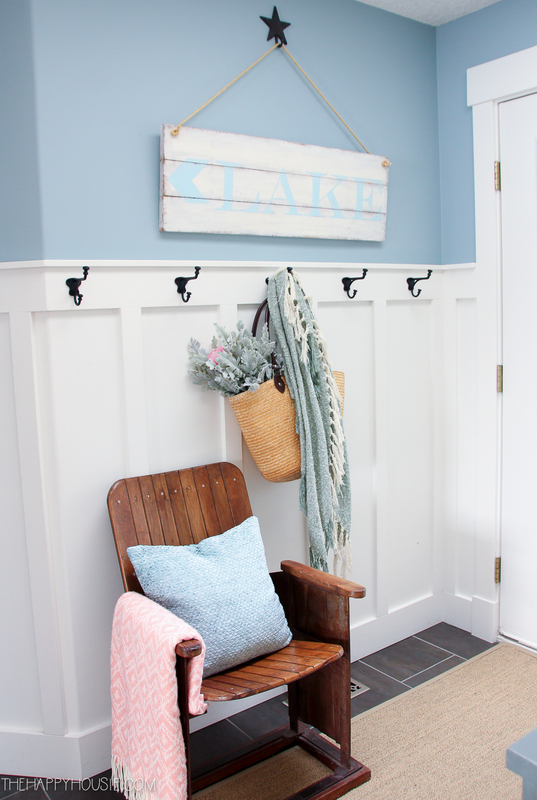 Because we have a closet and a row of hooks along one wall in our mudroom/laundry room, we don’t use our front door as an entrance at all, unless we have guests over, which means that we don’t really need much storage in this area. BUT!!!! With some recent changes (and this new hutch in our dining room! ), I started moving furniture around in our house, yet again, and I think I MAY have finally found a combination that I like for the entry way. Select your furniture pieces wisely. I’ve made many mistakes over the years in trying to fit all of our furniture on the one wall, when it really works better to have one larger piece on the main wall and the chair on the opposite wall. The space feels much more evenly balanced this way. Also, don’t add more furniture than you need. We really only needed an entry table and a small chair for guests to put their shoes on. The rest of it is accessories that can easily be removed or added to over time. Our previous dining room hutch is now centred on one wall, while the vintage theatre chair is tucked under the last couple of hooks on the wall across from it. Consider adding some paneling to create a feeling of character in a small space. 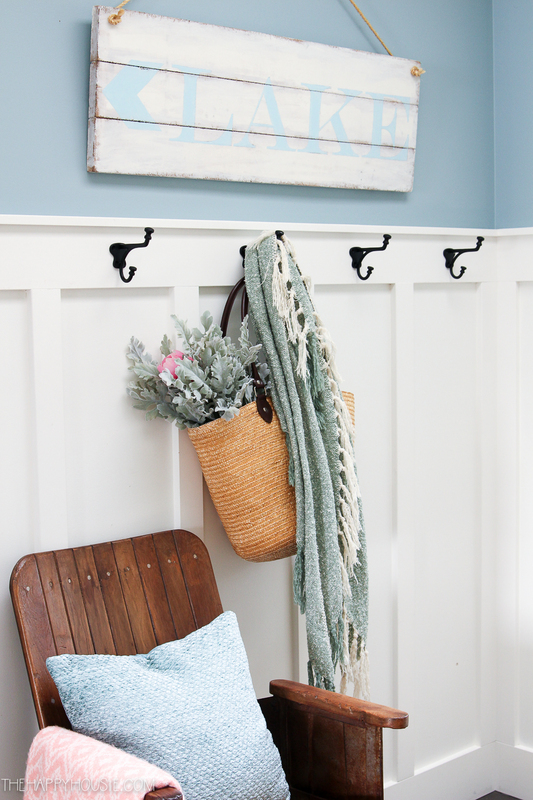 We added this DIY board and batten treatment, but shiplap is lovely and easy to add as well. You can even just add the paneling to one feature wall if you don’t want to do the whole area, or have awkward angles and aren’t sure where to end a paneling treatment. Another way to add character or interest is through a simple feature wall or door colour. I love our DIY map wall, and it has a place of prominence in our home. If the walls weren’t already blue, then I would likely paint the door instead for an added pop of colour or interest. Add accessories and art that work with the overall feel of your home, and consider mixing new and vintage for extra character. I absolutely love our starburst mirror, and moving it from our living room into our entry space over the new hutch has given this room a completely different feel. Mixing and contrasting these newer pieces with finds like our vintage typewriter and vintage theatre seat creates a more collected and eclectic feel (i.e. it doesn’t feel like we just ordered the whole room out of a catalog). Switch things up with the seasons! 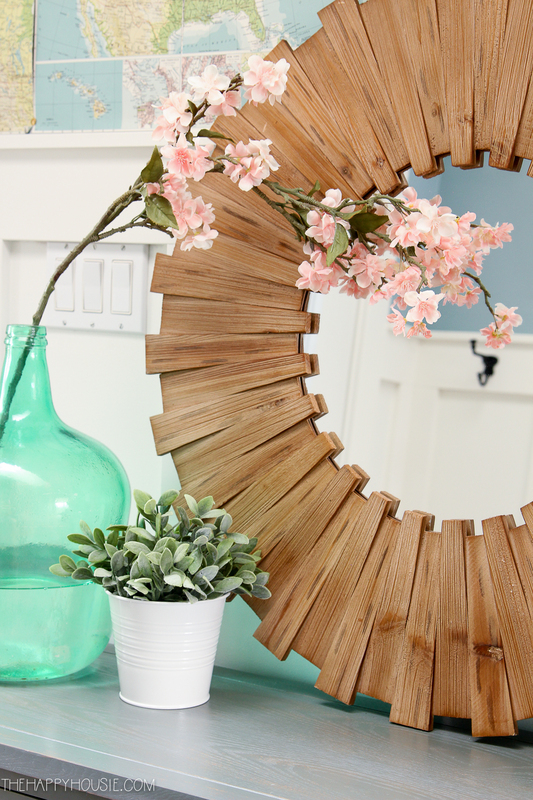 Just because it’s a tiny entry doesn’t mean you can’t have fun and play around with the decor. To give this space a springy feel, I just added some colourful accents that work with the colours we have in the rest of our spring decor; and popped some faux flowers in vases and baskets. 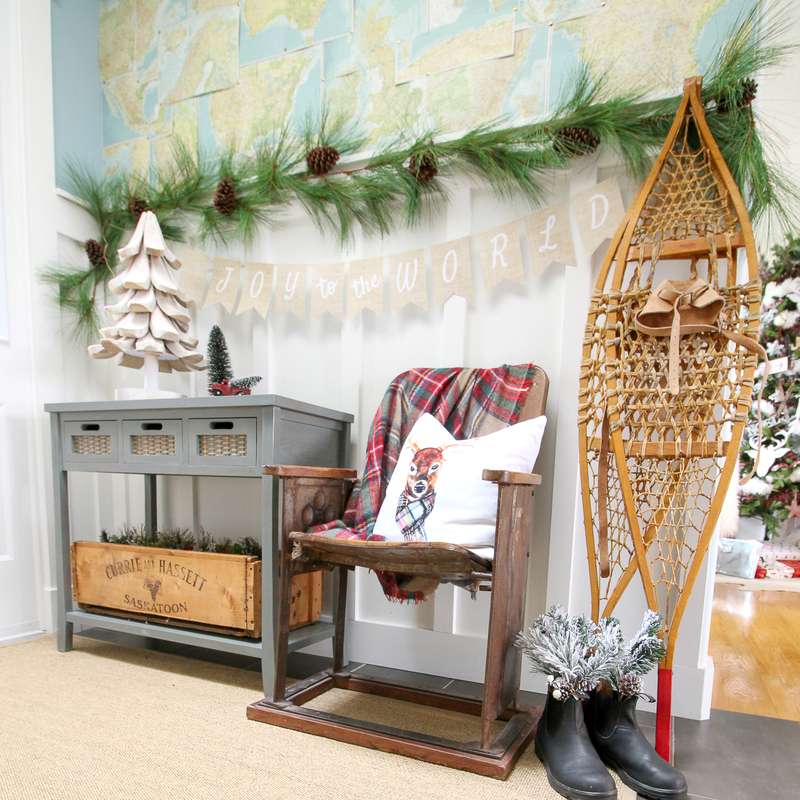 It’s a quick and easy space to add a fresh, seasonal feel to! Did you see something you love? Shop the look! The theatre chair and typewriter are both unique finds from vintage shops, but the rug, console, and sunburst mirror are fairly easy to source. I’ve gathered them along with similar items below, for your shopping convenience! And, as I mentioned, today I’m part of a fun spring hop! 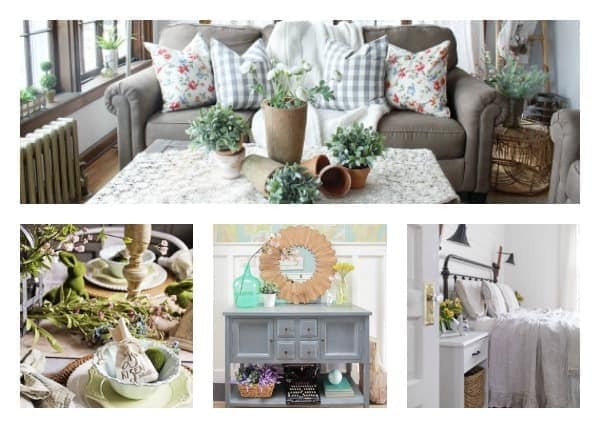 Next up, is Farmhouse on Boone with her simple spring farmhouse bedroom! And you can hop around and take in all the inspiration, below! I love your entry! It’s colorful and pretty and it looks like you’ve maximized the space perfectly! I’m especially fond of that vintage theater chair – I’ve been on the hunt for one or two even though I have absolutely no place to put one! Beautiful space for spring! Krista – this is perfection! 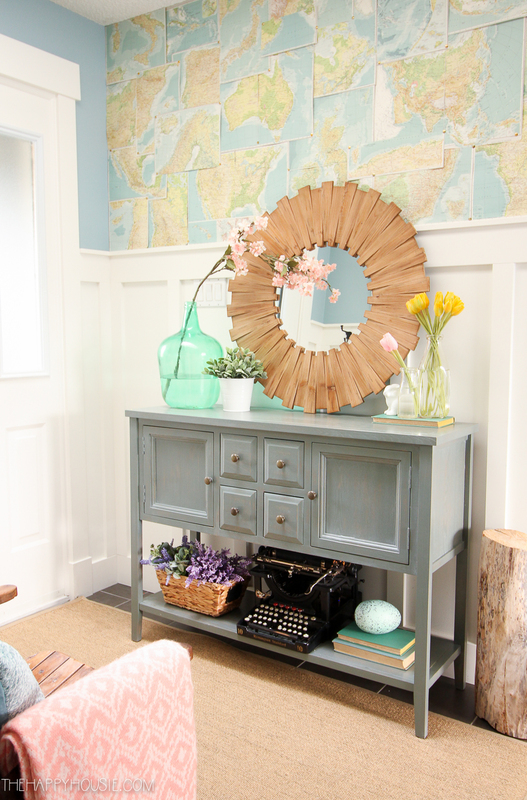 I love that accent wall with the layered maps – such a genius idea! And that theater chair is so adorable! Your DIY Map Wall is very interesting! 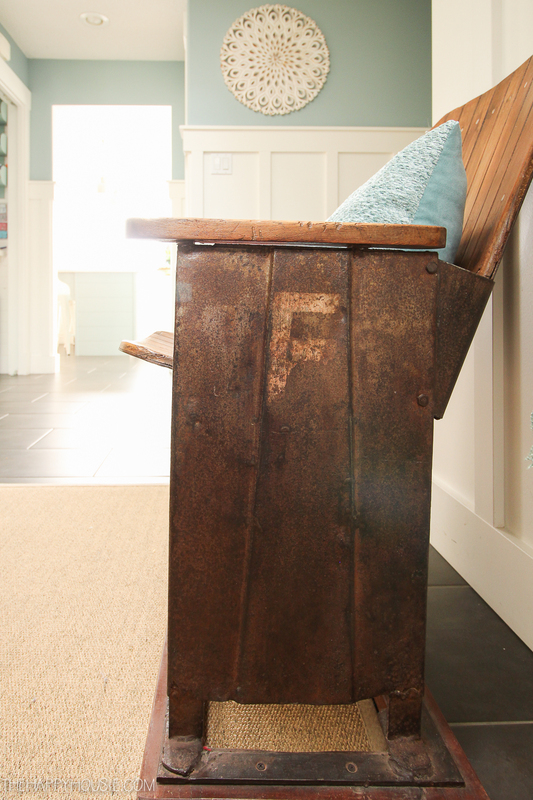 It adds character to your foyer. I wish we had entryway, even a small one! Krista, your entry is so welcoming. Love the board and batten walls. We just hung a very similar mirror in our bedroom. 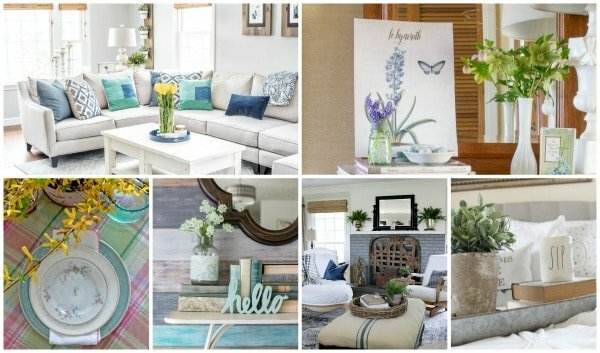 Great tips for decorating any room. 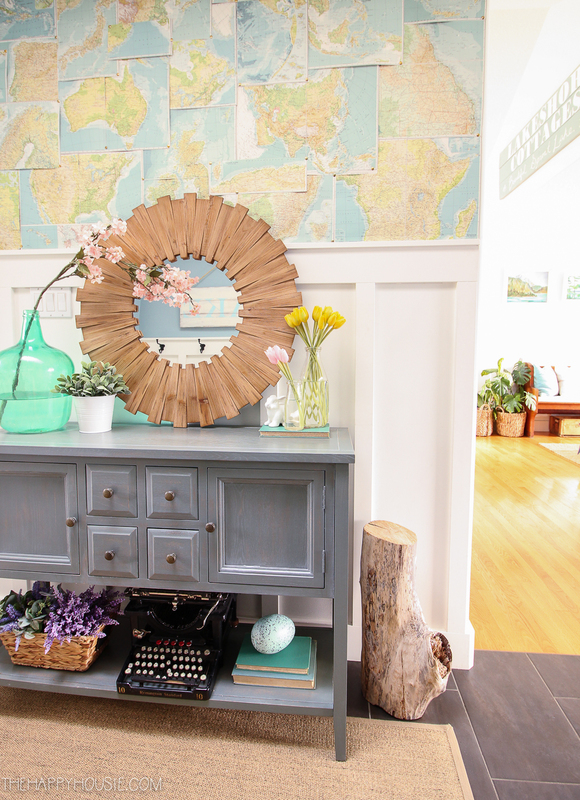 Your foyer is so cute! We live in a ranch house where the front door opens right into the living area, so I can totally relate to small foyer/no foyer dilemmas! 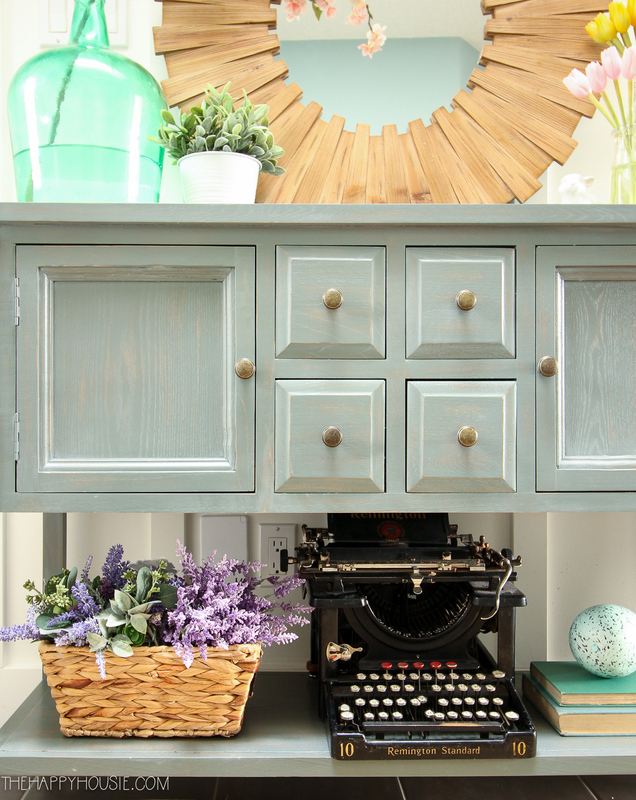 This entryway is absolutely gorgeous! I love all the happy spring colours you’ve added and it all works so nicely together. Cheers. 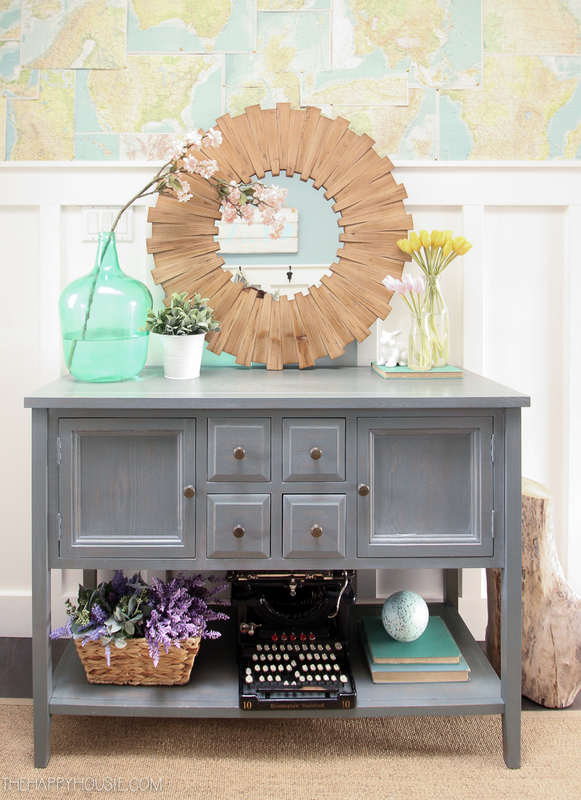 Your foyer is gorgeous!! I love that typewriter and the mirror! I love that map wall! So fun and a great way to add a lot of character to a small space! I love all the color! Such a pretty combination especially with your touches of spring! LOVE the vintage maps! Such a beautiful and inventive wall covering. Just fabulous! That map wall is so fun! I love how you mix old and new! 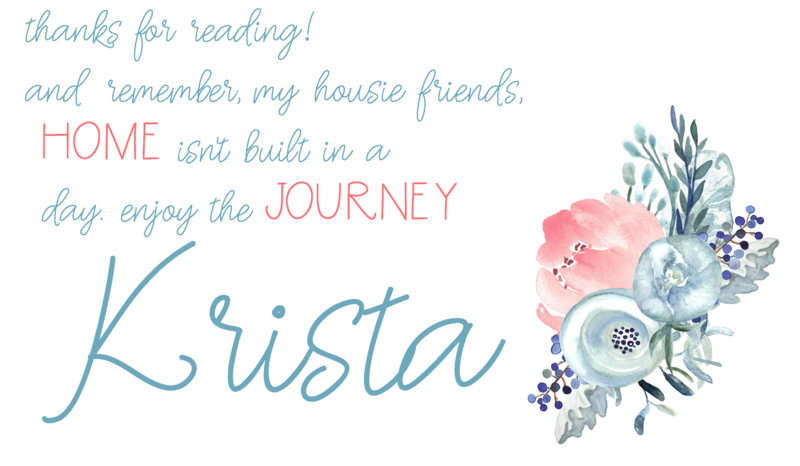 I always love your home, Krista! It’s so pretty and colorful. You have the perfect touches for spring!